The Rose Breasted Cockatoo or Galah as it is called in Australia is extremely popular as a pet and has managed to adapt to the loss of its habitat. These birds simply changed their diets and now live on farmland rather than on wild-found food, no doubt to the dismay of the encroaching farmers. 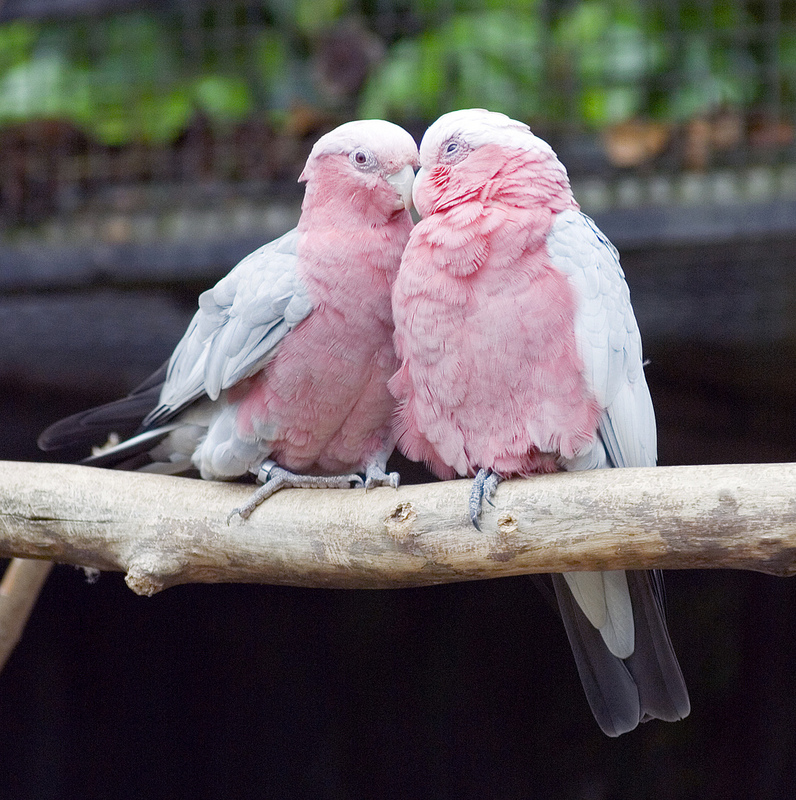 Because of their social nature, Rose Breasted Cockatoos or Rosies as they are affectionately called, make loving pets. In the wild, they live in flocks of up to a few hundred birds. While they traditionally feed on seed in open grasslands and savannahs, Rose Breasted Cockatoos have adapted to the farms that swallowed up their natural habitat. They see it simply as an opportunity for easy feed, much to ranchers’ and farmers’ irritation. They tend to forage on the ground during the cooler hours of the day, and sleep during the hot hours in the treetops. The night finds Rose-breasted Cockatoos roosting in eucalyptus trees. These birds are well adapted to drought situations, and need little water or moist food. Rose Breasted Cockatoos are good scavengers and seem to adapt well to changes in their environment. In captivity, they should be provided with a variety of fruits, legumes, and vegetables, in addition to fresh water and a good basic seed mix or pellet food. It has been reported that they also eat mall amounts of meat. Rose Breasted Cockatoos can chew through almost anything, so they should have some chew toys among their other toys. They are very smart and love to keep your company or learn tricks. They seem to prefer running and climbing to flying. Rose-breasted Cockatoos are good talkers, though males are reported to be better talkers than females. 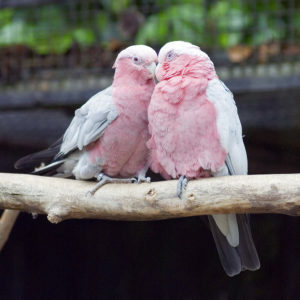 These are affectionate birds that love to give kisses; even wild-caught birds have been known to be quite affectionate. Rose-breasted Cockatoos do fine in aviaries that are five meters by one and two tenths meters by two meters in dimension. They will need a nesting box to hide in, in case they feel stressed or sleepy. Be sure to provide your Rose Breasted Cockatoo with leaves or paper shreds so it can comfortably arrange its nesting box and feel perfectly at home there. Rosies will also need to be kept warm in winter. If males are not paired or socialized early, they may become territorial and aggressive. Captive bred birds make more affectionate and healthier pets than wild-caught birds. 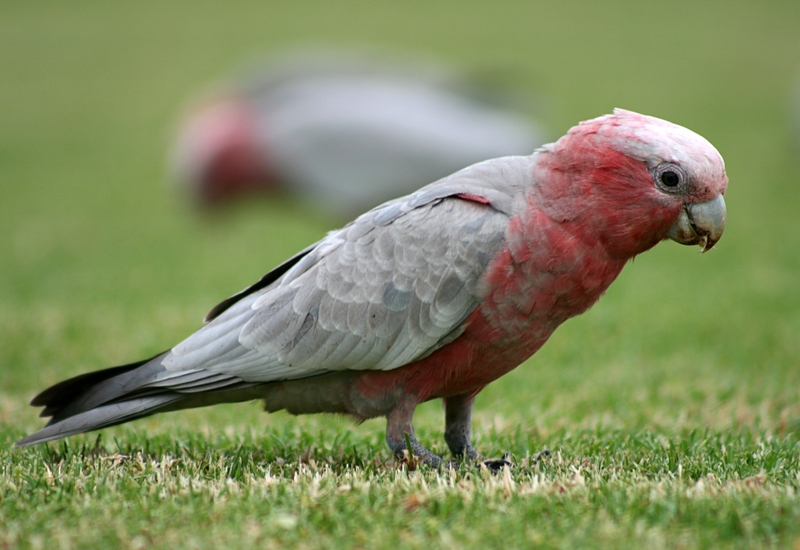 At maturity, Rose Breasted Cockatoos are about 35 centimeters long and weigh around 350 grams. Their feathers are soft and down-like, making petting time as enjoyable for the petter as it is for the pet. In the wild, Rose Breasted Cockatoos live for around 20 years; in captivity, they live 70 or 80 years. Rose Breasted Cockatoos are native to Australia, where they destroy crops and are considered to be pests in many regions. In the past some areas distributed culling licenses, though this is no longer practiced. As pets, Rose Breasted Cockatoos are quite popular. They are affectionate, smart, and can talk quite well. As always, captive-bred birds make better pets than wild-caught birds. 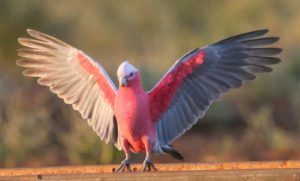 Today it is illegal to take a Rose Breasted Cockatoo from the wild. Because Rose Breasted Cockatoos are prone to tumors, it is essential that they have balanced, lowfat diets and lots of exercise. Never offer avocado as food, because it may kill your bird! Be sure your Rosie has many chew toys, as they are prone to boredom and chewing their own feathers. They should be wormed regularly. Occasionally, wild-caught Rose Breasted Cockatoos may become unpredictable at maturity. Rose Breasted Cockatoos are quieter than most Cockatoos, but by that comparison, this is still quite noisy! Rose Breasted Cockatoos mate for life. They reach sexual maturity at two to three years of age, and they breed very well in captivity. In the wild, the mating season begins with the rainy season. Birds build leaf, twig lined nests in hollow eucalyptus trees, and mating displays include short flights. In captivity, your Rose-breasted Cockatoo should have a softwood nesting box so that they can chew on it, as the wood chewing helps induce breeding. An average clutch contains two to five eggs, which will incubate for a month. 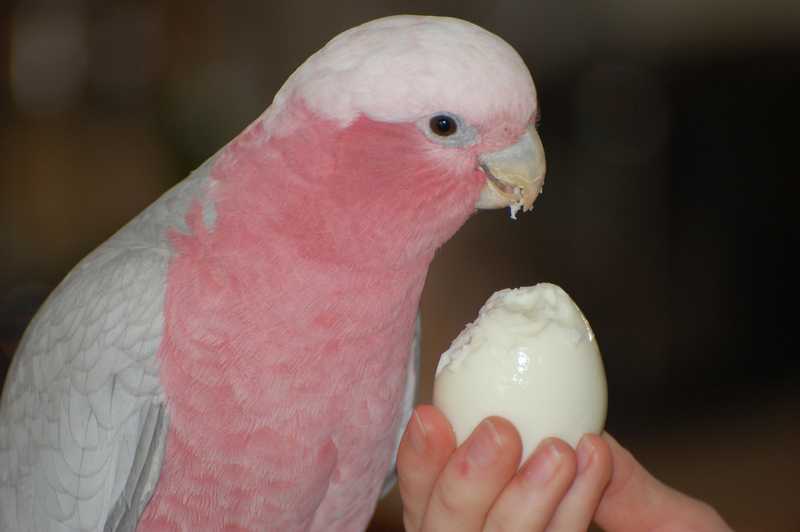 Rose-breasted Cockatoos have broad, elliptical, slightly glossy eggs. The fledgling period lasts around two months. 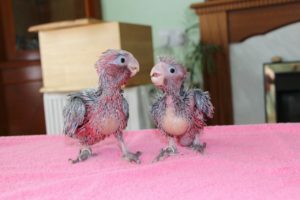 Before and during breeding, it is best to supplement your Rose Breasted Cockatoos with extra animal protein and sprouted seeds. Females are recognized by the lightness of their irises when compared to the dark or black irises of males.